Regional publisher Newsquest is set to launch a new paid-for newspaper for a market town next week. The Wilmslow Guardian is to become the latest addition to the publisher’s Guardian series in Cheshire, which also includes the Knutsford Guardian, Northwich Guardian and the Crewe and Nantwich Guardian. Its first edition is set to be published on 20th May and will be edited by Carla Flynn, who leads other Guardian titles in the series, while one extra journalist will work on the title along with the existing editorial team. The move comes after Trinity Mirror’s launch last month of the Manchester Weekly News, which has a Wilmslow edition, to replace six existing titles including the Wilmslow Express. 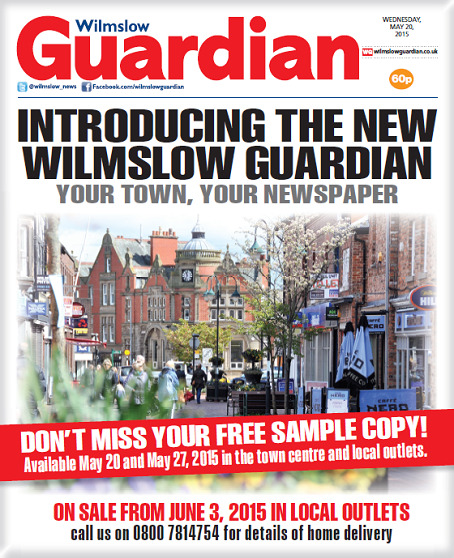 A promotional poster shows how the new Wilmslow Guardian will look. For the first two weeks of publication, free copies will be available to residents from various outlets, with the title then being on sale from 3 June. Said Carla: “This is an exciting time for the Guardian team and we’re relishing the opportunity to cover a new patch. “Local newspapers are at the heart of the community and we want to be at the heart of everything that happens in Wilmslow. “The Guardian brand is already well-established in neighbouring towns. Our newspapers are more than 160 years old and people trust us to be their eyes, ears and voice. “We want to build that same great relationship with the residents of Wilmslow. Wilmslow lies 11 miles south of Manchester and is known for having a high proportion of wealthy residents. Regional managing director Chris Hughes said the plans for the new title had been well received. He said: “I am delighted to be launching a new paid for title into the vibrant market town of Wilmslow. “We have been engaging with business leaders and community groups over recent weeks and our plans have been universally well received. “We need to see this support transfer into action now, with businesses supporting the title with their advertising budgets and the people of Wilmslow purchasing the title on a weekly basis. Great news patch. “Town reveller in unkempt hair shocker”. “Residents up in arms at Pound Bakery plans”. Yeah, and actually for a change it is ‘exciting’. Well, relatively. A new newspaper being launched and more staff (ok, one) being taken on is not just exciting these days. It’s flippin’ miraculous. Good luck to the venture. Have always said Trinity Mirror must have been mad to have abandoned its Wilmslow title. Love that red Masthead. see it a mile away. good luck to all. great to see some positive news.